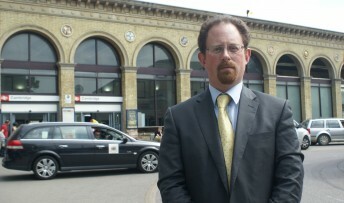 MP Julian Huppert has pressed the case for Cambridge’s new Science Park station with Rail Minister, Simon Burns yesterday (Thursday, January 31) at a four county rail summit to push forward the campaign to improve rail travel across East Anglia. Mr Burns told delegates, which included MPs from across the region, council officers, business representatives, Network Rail and train operators that the station was one the government wanted to open. Julian also highlighted the East West rail link which involves opening the old Varsity line linking Cambridge to Oxford. He said: “I will continue to push for both these important projects at every opportunity. “The new Science Park station will make such a difference for commuters and businesses in our city. It will help to ease congestion to the north and make Cambridge even more attractive to new high tech businesses or those wishing to relocate. I have campaigned for it for over a decade, and am delighted that it seems finally to be making progress. “And the East West rail link brings huge benefits not only for Cambridge but for the region as a whole. There is huge growth taking place across East Anglia and this project will allow us to capitalise on that growth and drive forward our economy. The summit discussed train service franchising and calls for improvements which include faster journey times, increased reliability, better carriages and improved infrastructure. Julian added: “This is a crucially important time for rail travel with rail franchises coming up for renewal and the government looking to invest in infrastructure projects to boost economic growth. “It is vital, therefore, that we impress upon the government the need to invest in our region so that we can have better rolling stock and a faster, more efficient service.